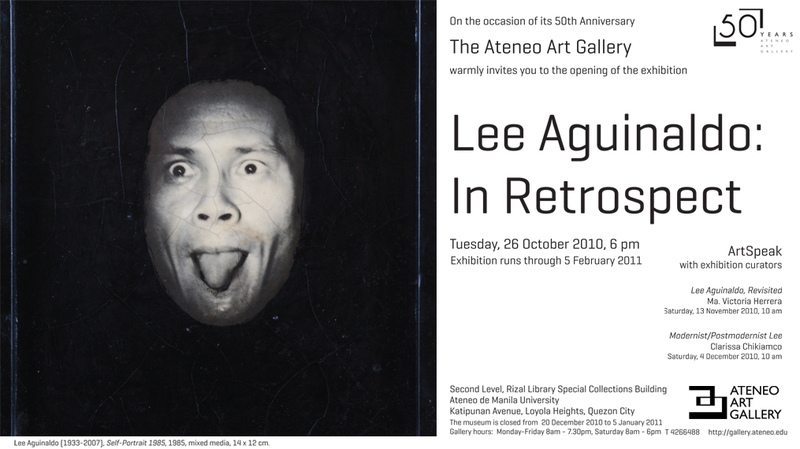 The Ateneo Art Gallery warmly invites you to "Lee Aguinaldo, Revisited," an ArtSpeak session with Ma. Victoria Herrera, co-curator of the exhibition, Lee Aguinaldo: In Retrospect, on Saturday, November 13, 2010 at 10am. For more info, contact Ian Carlo Jaucian at (632) 4266488 or 4266001 ext. 4160, or email: ijaucian@ateneo.edu. 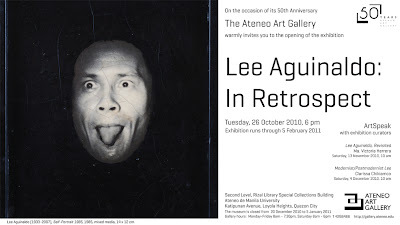 As part of its year-long 50th anniversary celebration, the Ateneo Art Gallery launches the exhibition Lee Aguinaldo: In Retrospect. Among the illustrious first generation of Philippine abstractionists in the 1950s, Lee Aguinaldo (1933-2007) is often identified with abstract expressionism and hard-edged and color field paintings. This representative exhibition of Aguinaldo’s output incorporates his more celebrated styles as well as his other lesser known experimental approaches that also form an important part of his contribution to Philippine art. A self-taught artist, Aguinaldo began his artistic career at a young age as among the artists in the 1952 annual show of the sanctuary of modern art, the Philippine Art Gallery (PAG). He was also part of the landmark show, “The First Exhibition of Non-Objective Art Exhibition in Tagala,” held in the PAG in 1953 with other artists such as Fernando Zobel, Vicente Manansala, H. R. Ocampo, Arturo Luz, Victor Oteyza, and Nena Saguil. Aguinaldo held his first solo show in 1956 and, later in the 1960s, won major awards in the Art Association of the Philippines Annual art competitions. Known as being a brilliant colorist and being very particular about his materials, Aguinaldo is credited by many for introducing local artists to the use of acrylic as an artist’s medium, particularly the high-end brand “Aquatec” which he used over marine plywood. Although he was more known for his abstract works, Aguinaldo created figurative works throughout his life. He was a consummate drawer and he was among the first, if not the principal exponent, in adopting ideas of Pop Art by incorporating printed images from glossy fashion magazines like Harper’s Bazaar into his oil paintings, particularly the Galumph Series. He loved to experiment with different processes inspired by his up-to-date resources of art magazines. His mixed media works incorporate frottage or surface rubbings, pencil, image transfers, collages and acrylic emulsion, reminiscent of the works of American Pop artists Robert Rauschenberg, Larry Rivers and Christo. In the mid-1970s until the early 1980s, Aguinaldo closely collaborated with his photographer friends: the late portrait photographer Butch Baluyut and Wig Tysmans. This interest on the graphic arts produced a series of photo collages taken from print media and photographs “flattened” or sealed with acrylic emulsion. The exhibition, curated by Ma. Victoria Herrera and Clarissa Chikiamco, presents Aguinaldo’s many facets as an artist. Further talks on Aguinaldo’s life and output will be given by the exhibition curators as part of the Ateneo Art Gallery’s Artspeak program: Lee Aguinaldo, Revisited by Ma. Victoria Herrera on Saturday, 13 November 2010, 10 am and Modernist/Postmodernist Lee by Clarissa Chikiamco on Saturday, 4 December 2010, 10 am.